Supplementary food indicated during the treatment and prevention of intestinal parasites of dogs and cats. VermiStop is formulated with dry extracts of 6 plants that help create a hostile environment for the parasites and stimulate the natural physiological functions of the organism against them. Its components have been shown to have activity against different species of nematodes, cestodes and intestinal protozoa. VermiStop is a natural and non-aggressive solution for the organism. By containing a mixture of plants, its spectrum of action is extended to several species of parasites, while reducing the chances of generating resistance. Garlic has activity against different species of parasites, including Toxocara and Giardia, through the interaction with enzymes with thiol group. In addition, it acts as an immunomodulator, which will facilitate the detection and response of the immune system against parasites. Its anti-inflammatory action improves symptoms derived from parasite infection. Also, garlic naturally repels mosquitoes, fleas and ticks. Thanks to this, an insect infected by parasites has less predisposition to sting the dog or cat. Pumpkin seeds have been shown to be effective in controlling gastrointestinal parasites such as tapeworms and nematodes. It should be noted that it has shown in vivo activity against Toxocara cati, one of the most frequent round intestinal worms in cats. The high mucilage content helps to expel the parasites from the digestive tract. In addition, marshmallow contributes to alleviate the digestive problems often seen after infection with gastrointestinal parasites, such as diarrhea. It exerts a soothing and protective effect on irritated mucous membranes. This is key to maintaining the integrity of the intestinal wall, one of the components of the body's first defensive barrier. Contains 95% polyphenols, a type of tannin-condensed. Tannins have shown anthelmintic properties in animals infected with intestinal parasites. Among them, reductions in the number and fecundity of intestinal nematodes and decreases in the number of eggs in the feces were observed. Tannins also help fight the parasites indirectly, by modulating the activity of the immune system. The barberry extract contains 97% berberine. This compound has been shown to have antiparasitic activity in vivo against Coccidia, Giardia and Amoebas. It also helps to stop diarrhea and reduce inflammation, symptoms that often appear associated with infection by intestinal parasites. It is a plant very recognized for its immunomodulatory activity. Coopera in the optimization of the activity of the defenses to stop the colonization of the organism by the parasites. 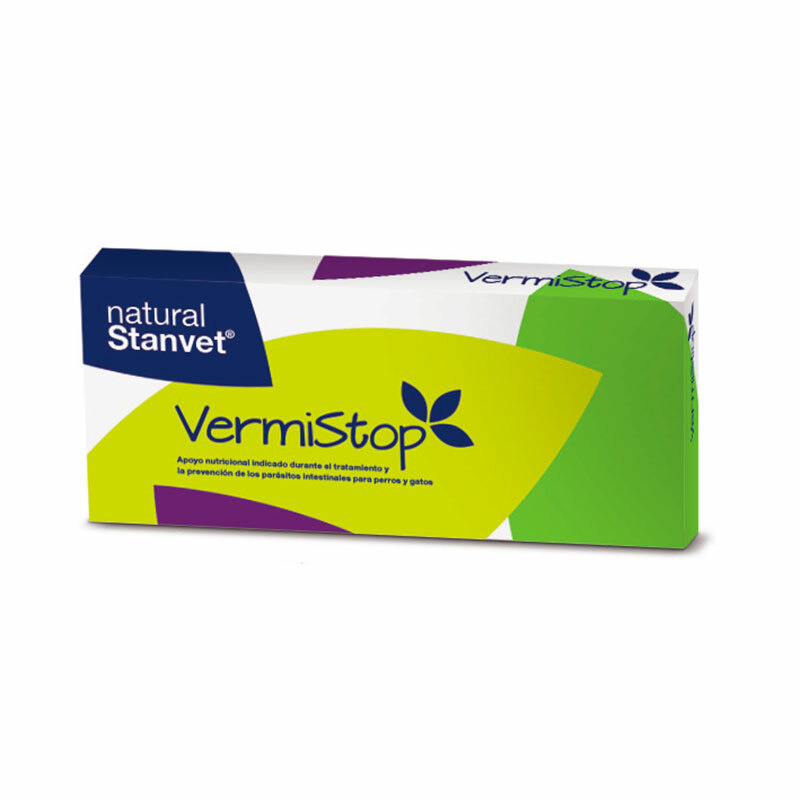 VermiStop is indicated during the treatment and prevention of intestinal parasites of dogs and cats. It helps to strengthen the physiological processes against parasites while creating a hostile environment to reduce the chances of infestation. - In low risk animals, as an alternative to periodic anthelmintic treatment. • Nutrition: animals that hunt, eat viscera, raw meat, etc. • Travel for vacations, exhibitions, transfers, etc. Transmission of diseases from animals to persons (zoonoses). 1 comp. / Day for every 10 kg weight, for 5 days. Rest for 15 days and repeat the administration 5 more days. It is recommended to follow this guideline 4 times a year, and can be modified at the discretion of the veterinarian according to the biological characteristics of the intestinal parasite. For more information, please refer to ESCCAP guides 1 and 6. • Clinical package of 120 tablets of 1.3 g in blister pack. In addition, it is a good complement to the external parasites: garlic helps prevent insect bites, avoiding the transmission of diseases. VermiStop is part of a comprehensive antiparasitic protocol. In addition to its administration, it is important to avoid the major sources of parasitic infestation as far as possible. - Freeze meat and raw fish before giving it to the dog or cat - Use insect repellents to avoid ectoparasites, which can transmit diseases to our pets. You can consult our range of Pulvex repellents: Precautions of use It is recommended to use with caution in: - pregnant females and puppies: there are no studies on this. - Iteric: barberry may increase the release of bilirubin. - Animals with pathologies related to the immune system or in treatment with immunosuppressants: by the immunomodulatory effect of VermiStop. - Animals on treatment with anticoagulants: for the possible sum of therapeutic effect with the garlic.